Workers at Roberto Clemente State Park stand with the monument to the baseball great and humanitarian. BRONX — Days after Hurricane Maria devastated Puerto Rico, workers at Roberto Clemente State Park stepped up and fulfilled the park’s namesake’s final mission. Clemente, the legendary Pittsburgh Pirates outfielder and baseball Hall of Famer, was killed on Dec. 31, 1972, after a plane he personally packed with relief supplies for the earthquake-ravaged people of Nicaragua crashed into the sea shortly after taking off from San Juan. His remains were never found, but Clemente’s legacy and humanitarianism have inspired countless generations. catastrophic damage in Dominica and the U.S. Virgin Islands. The death toll stood at 49 in Puerto Rico as this edition went to press, but health officials expected that number to rise. More than a month after the hurricane, most of the 3.5 million U.S. citizens living there remain without electricity, drinking water, basic medical supplies and in many cases, even adequate food supplies. “As unionists and fellow human beings, we need to do everything we can to assist our brothers and sisters in Puerto Rico,” said Lester Crockett, Metropolitan Region president. AFSCME has thousands of public sector members in Council 95 who live and work throughout the island. Many of these workers have been endlessly working as first responders, despite being also affected by the storm. 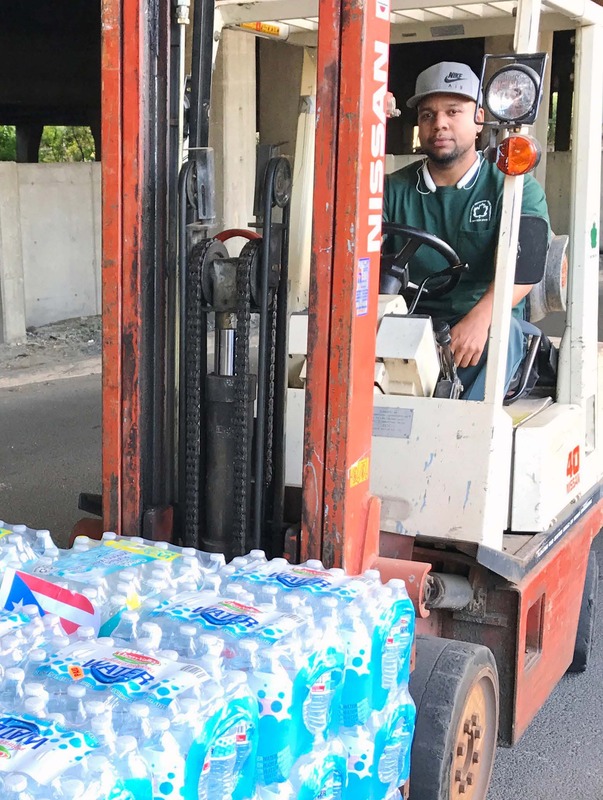 AFSCME is among the labor unions working to raise money to help provide basic needs for Puerto Rico. One way our International Union is providing help is through the AFSCME Fallen Heroes Fund that provides relief and immediate assistance to members who are affected by natural disasters. Even before the storm, the U.S. territory was already wrestling with a fiscal crisis fueled mostly by many of the same hedge funds, banks and corporations that created the housing mortgage crisis in the U.S. and economic turmoil in countries like Argentina and Greece. Roberto Clemente State Park worker Jason Anglada helps to load and unload water pallets that are being sent to assist the people of Puerto Rico. Dozens of individuals, families and groups among the many New Yorkers are stepping up to help those affected by the storm. At Roberto Clemente State Park, the community and park staff are working together to ensure the people of Puerto Rico get help. In recent weeks, church groups, schools, local colleges and businesses are among those who have provided volunteers and essential supplies to the island. Workers at the park’s drop-off center have also collected, sorted, boxed and stacked more than 300 pallets of supplies to be delivered to people in need in Puerto Rico. “It’s great to help people, especially in a situation like this,” said Garry Bassin, a general mechanic. While emergency relief is still the primary concern for many on the island, the rebuilding of the island is also a concern.